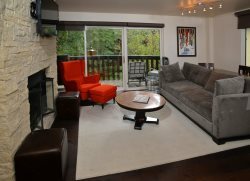 A beautiful vacation condo in Vail Village. The perfect combination of incredible vacation condominium and 4 Star destination hotel. You'll enjoy this spacious 1,400 square feet, 2 bedroom condominium. Includes 2 full bathrooms, fully equipped kitchen, daily housekeeping and a nice living area with TV, DVD, and Wi-Fi. You'll also like the private balcony or patio with views of Vail Mountain or Gore Creek. The bed size is either king or queen, and many condos include a double Murphy bed, or a sleeper sofa. For over 50 years, this destination hotel along the banks of Gore Creek has provided a peaceful setting for vacationing couples, families and small groups. Manor Vail is one of Vail's iconic destinations that has a variety of vacation accommodations including studios, condominiums and hotel. Vail Village Rentals can help you get the most from your vacation with assistance planning your stay. Phone us today and let us help you plan your stay. (970) 476-7529. * The Lord Gore Restaurant. * A short walk (6 football fields) to the epicenter of Vail Village. * Delightful shops and cafes. * Most packages, include a delicious and complimentary breakfast buffet. * Directly across from Golden Peak ski lift. * Condos are fully furnished. * Nearby Ford Park, Amphitheater and Betty Ford Botanical Garden. Weddings at Manor Vail Lodge take place in our gardens or in our ballrooms, and the bride, groom and family will enjoy this magical time a sophisticated wedding venue with customized services. At Manor Vail Lodge, your wedding is all about you.